Chinese importers are unwilling to purchase Canadian canola seed at the moment, according to the group that represents the industry in Canada. Earlier this month, Chinese customs authorities revoked the sales licence for a major Canadian canola distributor, Richardson International. Officials said the move was related to "dangerous pests" such as fungi in the crop, an allegation the company has strongly denied. Against the backdrop of escalating trade tensions with China, there is much speculation that pushing back against a major Canadian crop was an attempt to send a political message. China tore up a bilateral trade deal with Norway and restricted imports of salmon from that country after Norway awarded the Nobel Peace Prize to Chinese political prisoner Liu Xiaobo in 2010. "China always links its trade diplomacy with its foreign policy," said Meredith Lilly, the Simon Reisman Chair in International Affairs at Carleton University, and an associate professor on international trade. "They've made this claim before," she said, referring to the allegations Canadian canola is somehow unsafe, "because to not make one with a legal justification would be an outright admission that this is just about geopolitics." Regardless of China's true motivations, Richardson is no longer the only Canadian canola seller being shut out of the Chinese market. There are 18 members of the group that represents the industry in Canada, including Viterra Inc., Louis Dreyfus Company, Cargill Ltd. and Parrish & Heimbecker Ltd. All of them say their contracts to sell in China are just drying up. "While there was some initial optimism that Chinese concerns with canola trade could be resolved quickly, technical discussions to date have not indicated an immediate resolution is possible," said the Canola Council of Canada (CCC). "Canola seed exporters report that Chinese importers are unwilling to purchase Canadian canola seed at this time." Canola seeds can be crushed to produce an oil used in food and cooking. The "can" in Canola stands for Canada, since the specific variety of the plant known as rapeseed that has a bright yellow flower was invented by Canadian researchers in the 1970s. 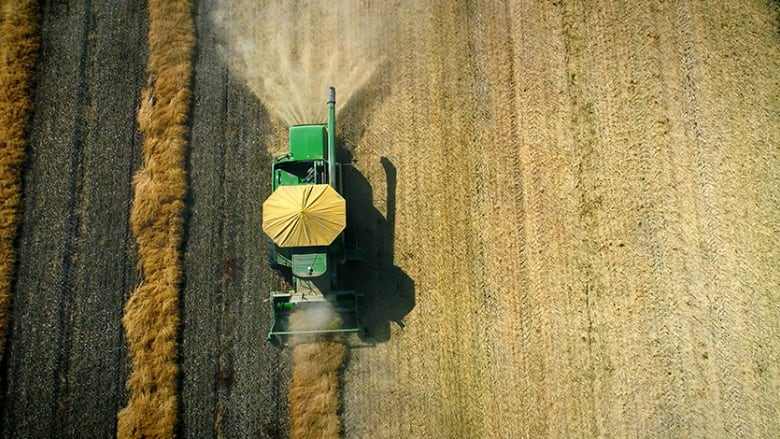 A spokesperson for the canola group says that to their knowledge, oil and meal are not subject to the same "challenges" that the seeds are having in China. About 40 per cent of Canada's canola seed exports last year went to China, worth about $2.7 billion. 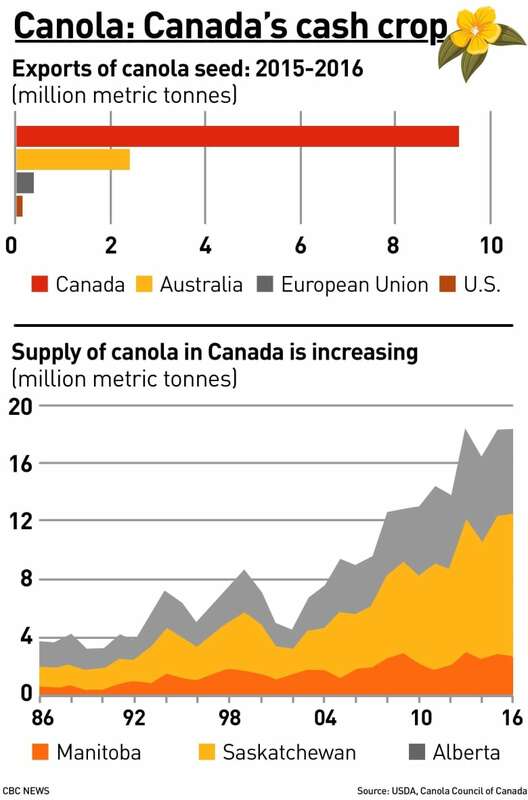 Canada also sent about $1 billion worth of canola oil to China, and about $500 million worth of canola meal, which is the name for canola seeds after they have been crushed and separated from their oil, leaving a product that is used as animal food. "We urge the government of Canada to continue to intensify efforts to resolve the situation," CCC president Jim Everson said. Canada's Minister of Agriculture Marie-Claude Bibeau said China only recently agreed to have scientists assess the claim that they have found organisms in Canadian canola, after they claimed that about Richardson's. "Officials from both countries will continue to engage in order to find a science-based solution to this issue as quickly as possible," Bibeau told CBC News on Friday. "We are working closely with industry stakeholders on this matter, and we will continue to keep them informed as additional information becomes available." The sudden canola clash has sent prices for the crop plunging. For delivery in May, it has fallen almost $10 to $458 a tonne on Friday, only slightly ahead of the multi-year low of $455 it hit earlier this month. Lilly said Canadian government officials should do their utmost to solve the dispute, but ultimately she suspects they may not have enough tools at their disposal to make that happen quickly. "Canada does not have currently a great deal of levers to reverse this situation." Alberta Premier Rachel Notley weighed into the dispute on Friday, noting how important the industry is to the province she leads, and calling on the Federal Government to "work very hard" to resolve the issue. "If they are unsuccessful at doing that, then all Albertans will be looking to the federal government to supply relief to our canola industry just as they would to SNC-Lavalin, just as they would to GM, just as they would to any other industry in the country that is in jeopardy because of … international actions outside of our border," Notley said. "We have also requested that the federal government elevate their engagement to a diplomatic level to rectify this situation as soon as possible." Prime Minister Justin Trudeau called it an important issue on Friday when speaking with reporters. "So, we're going to roll up our sleeves and work with the Chinese officials to demonstrate that canola should continue to flow safely from Canada to China," he said, adding the government is optimist it'll be able to make headway this year.